Wireless ADSL router is not only able to receive ADSL connection, but also other connections are provided via RJ45 port. Besides having a line of E series, Linksys also has a X series product line. 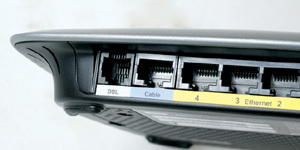 These products which included in the X series has basic function as an ADSL modem. In addition, there are a number of other features as they appear in E series. This time we had the opportunity to test one of the Linksys product variant X series, the X3000 Linksys, an ADSL modem that can also function as a wireless router. Physically, the X3000 Linksys display is similar to Linksys products generally flat shaped design with elegant and minimalist. The size is also quite compact and does not take up much space. The material used is also quite good with a sized plastic fairly thick. Partially coated matte surface that is not easy to leave fingerprints. With its thin, elegant, and minimalist, the Linksys X3000 also does not use an external antenna. However, the quality and signal coverage produced is still good. As a middle-class wireless ADSL router, Linksys X3000 has a very exciting specifications. Wireless ADSL router supports wireless connection 802.11b, 802.11g, and 802.11n with claims up to a maximum 300 Mbps speed. Linksys X3000 only works at a frequency 2.4 GHz. On the back, there are five RJ45 ports and one RJ11 port. an existing RJ11 port is a port entry ADSL connection you use. Five RJ45 ports are divided into a WAN port and 4 LAN ports. Yes, in addition to using an ADSL connection via RJ11 port, you can also use the connection via the WAN port which provided. The entire existing RJ45 port supports gigabit. In addition, there is also a single USB 2.0 port in addition for storage media (such as an external hard drive or USB flash disk). And power switch is also available to help you turn on and off the device without having to unplug the adapter. Various features embedded on the Linksys X3000 is also quite interesting. 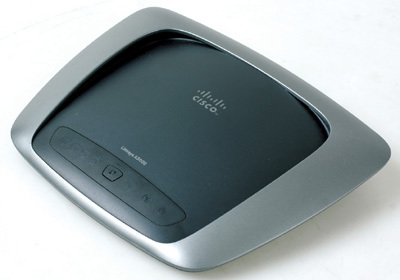 For general users, Linksys provides application Cisco Connect. Its function helps the user to do the initial setup internet connection and network. Various security features are available such as firewall, WEP encryption, WPA, and WPA2, MAC filter, parental controls, and guest access. This guest access feature lets outside users to join in networks. However, these users can not access other computers on the networks. In terms of performance, Linksys X3000 is quite good. With an 802.11n wireless adapter, we tested throughput and response time of this wireless ADSL router. And the result, Linksys X3000 is capable of producing an average throughput of about 61.004 Mbps, with maximum performance in a range 71.942 Mbps rate. The resulting throughput is also considered quite stable and responsive with a response time around 1 second. Linksys X3000 is a wireless ADSL router which is nice. In addition to supporting ADSL connection, RJ45 WAN port that is available also lets you use another connection. Its performance is quite good with a variety of features that already sufficient. Linksys X3000 Display Control Panel. In addition to an RJ11 port, there is also WAN RJ45 port as an alternative connection. Plus: good performance, there is RJ45 WAN port next to RJ11, gigabit LAN, USB port, complete features. Minus: internal antenna design does not allow additional antennas.